ABC's Lost has become a true phenomenon. On Oahu, tour companies are considering adding tours of Lost filming locations. One major PR firm is considering a media trip to Lost locations. Thanks to Oahu resident Ryan Ozawa's keen eye and excellent photography, here are ten new locations to offer you where Lost has filmed. Ryan and Jen Ozawa are the hosts of an excellent weekly podcast devoted to Lost called The Transmission. Be sure to check it out. One of the most popular episodes of Lost is Season 1, Episode 12 - Whatever the Case May Be. This is a Kate back story and shows the lengths she will go to in order to gain possession of the contents of a safety deposit box. The contents turn out to be a little toy plane that she and her childhood love buried in their youth and later dug up when Kate was fleeing the authorities. In this episode, Kate, played by the beautiful Evangeline Lilly, enlists the aid of several men to stage a bank robbery with her sole goal being to obtain the contents of the safety deposit box. 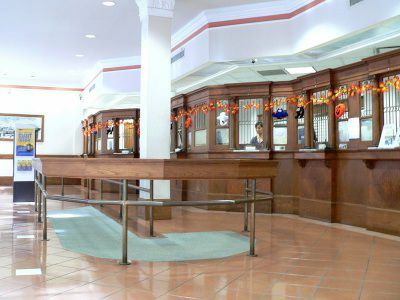 The bank scene was filmed in the Chinatown Branch of First Hawaiian Bank at 2 North King Street in Honolulu. It is known for its old-fashioned teller stations. View a Google map of this Lost location. In the same Lost Season 1, Episode 12 - Whatever the Case May Be, we find Kate and Sawyer wandering through the jungle of the mysterious island and coming across a beautiful pool and waterfall. As they dive into the pool, they soon discover the bodies of several passengers of Flight 815 at the bottom. Also, there is a case that the marshall escorting Kate back to the mainland had carried onto the plane. Kate quickly recognizes the case and the battle of wits begins between Sawyer and Kate to gain possession of the contents. We later learn that the case contains several pistols and also the small toy plane that has long been the object of Kate's obsession. This scene was filmed at one of the most recognizable locations on Oahu, Waimea Valley formerly known as the Waimea Valley Audubon Center and before that Waimea Falls Park. Located on Oahu's North Shore, this pool was once used as the site for daily diving shows. The once highly commercial park is now an Audubon Center with hundreds of acres of strolling paths and hiking trails, world class botanical gardens, and rich archaeological sites. The Waimea Valley is located at 59-864 Kamehameha Highway east of Haleiwa on Oahu. The character of Sawyer, as portrayed by Josh Holloway, is one of Lost's most complex characters. As a child, named James Ford, he witnesses a con artist swindle his family out of their life savings, prompting his father to murder his mother and then commit suicide out of grief. Young James vows revenge upon the con man but instead finds himself sucked into the same lifestyle to the degree that he even takes on the name of the hated con man, Frank Sawyer. In Lost Season 1, Episode 16 - Outlaws, James is told by his former partner Hibbs that the man who ruined his family and his childhood, the same man from whom he took his alias Frank Sawyer, was in Australia operating a shrimp truck. James travels there and kills him only to find out he has been set up and the man he killed was not Frank Sawyer at all. These tense scenes at the shrimp truck were filmed on Oahu's North Shore just east of the Turtle Bay Resort. Here you'll see the Famous Kahuku Shrimp Truck sitting on the ocean side of the road. Owner Kyung Ku, in business for 10 years, prepares her Kahuku shrimp dishes tempura-style and even with western barbecue sauce. This is the only place that advertises a choice of whole, head-on cooked shrimp. The Famous Kahuku Shrimp Truck is open daily from 9:30 a.m.-7 p.m. and, yes, Mr. Ku is quite alive. Actor Dominic Monaghan's character, Charlie Pace, has always dreamed of a career in music. He and his brother, Liam, start a British band called Drive Shaft. Struck by the band's surprising success, Charlie has second thoughts about the rock-star lifestyle which is heavily into alcohol and drugs. Lost Season 1, Episode 7, The Moth, finds Charlie in a confessional booth where Charlie confesses to giving in to the temptations that come with being a rock star. Charlie is prepared to abandon his dreams when he is confronted by his brother who advises him that the band has just been signed to a large recording contract. This begins Charlie's downfall into the culture he wanted to avoid. Charlie soon becomes a heroin addict. The scenes inside the church and in the church courtyard were filmed at St. Paul's Mission (Episcopal/Philippine Independent Church) on Queen Emma Square in Honolulu. This is located next to the Episcopal Cathedral Church of Saint Andrew. When asked for a favorite episode from Season 1 of Lost, many viewers select Episode 4 - Walkabout. John Locke, as portrayed by actor Terry O'Quinn, has one of the show's most interesting and mysterious back stories. Frustrated by his job at a box company where he is constantly belittled by his supervisor for his interests in war gaming and survival training, Locke dreams of more adventurous things. Tired of being told what he cannot do, Locke books a trip to the Australian Outback where the participants will hike through this difficult terrain. Upon his arrival in Australia, he is advised by the tour company that he cannot participate in the tour. We learn for the first time that Locke is actually a paraplegic and the company cannot ensure his safety. He is sent home angry on the doomed Flight 815. Much to his surprise, he discovers that after the crash he has regained the use of his legs. The scenes at the tour company in Australia were filmed at what was at the time a vacant retail space at 1 North King Street in Honolulu. It has since been leased to McClain's Auctions. The screenshot of this is taken from the inside of the building looking outwards. Ryan Ozawa has provided us with the photo above taken on the day of filming looking from the outside of the building in. Lost Season 1, Episode 21: The Greater Good, is an emotionally charged episode that includes a back story of Sayid Jarrah as portrayed by actor London-born Naveen Andrews. It also provides for two wonderful Lost locations located just a short distance apart. Sayid is obsessed with locating childhood friend, Nadia. As a communications officer in Saddam Hussein's Republican Guard he was, nevertheless, assigned to interrogate Nadia who was suspected of some crime. After being ordered to kill her, he instead arranges for her escape. Several years later Sayid arrives in Sydney presumably in search of Nadia. He is taken into custody by the CIA and ASIS. They are looking to locate a terrorist cell. Sayid denies any terrorist involvement. He soon learns that the authorities want his help in exchange for helping him find Nadia. It turns out that one of the members of the cell is Sayid's old roommate at Cairo University, Essam Tazir. Later in the episode, the scene switched to a mosque at a time of prayer. Sayid sees his old friend Essam across the room and approaches him after prayer is finished. The mosque scene was filmed in the Laniakea YWCA at 1040 Richards Street in Downtown Honolulu. Built in 1927, this building's Spanish, Colonial, and Mediterranean flare well suit the architecture of a mosque. The building's architect, Julia Morgan, also designed Hearst Castle in California. In the same Lost Season 1, Episode 21: The Greater Good, we later find Sayid has infiltrated the terrorist cell but still does not know their target or where they are storing explosives stolen from the U.S, Government. We pick up Sayid and his old friend Essam playing soccer in what appears to be a part in Sydney, Australia. You can clearly see the Sydney Opera House in the left of the scene. Sayid soon learns that his friend has been chosen to die as a martyr delivering the explosives to their target in a truck bomb. Sayid is now faced with allowing his old friend to continue with the plan and possibly die or losing Nadia forever. The park in this scene is actually the grounds of the Hawaii State Capitol Building located at in Honolulu's central historic area directly behind the 'Iolani Palace. The actual scene was filmed on the grassy area in the southwest corner of the grounds. If you stand in the grassy area and look towards Richards Street, you'll find many of these buildings. If you look closely at the screen capture linked to below, you'll see that many of the buildings are actually part of the Honolulu skyline. The second season of Lost began in September of 2005 and offered us several great location shoots. Lost Season 2, Episode 4: Everybody Hates Hugo focuses on the character of Hugo Reyes as portrayed by actor Jorge Garcia. This part of Hugo's back story begins on the evening that he has won $115 million dollars in the lottery. Hugo dreads that his entire life is about to change and fears that nothing will remain the same. As fans of Lost know all too well, Hugo has used the numbers that were recited over and over by a man in a mental hospital in which Hugo was also once a patient. These numbers continually appear throughout Lost and remain one of the larger mysteries of the show. Mr. Cluck's Chicken Shack is actually Popeye's Chicken at 1515 Dillingham Blvd. in Honolulu. Our eyes in the field, Ryan Ozawa was passing by in his car and noticed the show filming at this location. Lost Season 2, Episode 5: ...And Found includes a back story of Jin and Sun, the Korean couple. Jin-Soo Kwon as portrayed by actor Daniel Dae Kim is the son of a rural fisherman. He seeks a better life for himself than what his father has had. After finding no room for advancement from the positions of busboy and waiter at the Asiana Hotel in Seoul, he applies for a job at the Seoul Gateway Hotel. Jin is hired as a doorman but given strict instructions that this is a respectable hotel and he is not to admit anyone "like him" into the hotel. After what amounts to just a few hours or perhaps days on the job during which he had a chance encounter with his future wife Sun who was exiting the hotel after a lunch date, Jin makes the mistake of admitting a man and his small son who desperately needs to use the bathroom. When berated by his employer and instructed to find them and throw them out of the hotel, Jin quits his job and goes for a walk. Filming for the hotel scenes took place at the Royal Garden at Waikiki at 440 Olohana Street in Waikiki. Our good friend Cynthia Rankin of Hyatt Hotels in Hawaii spotted the filming which was near the Hyatt Regency Waikiki Resort and Spa and let us know about it. Our ace correspondent Ryan Ozawa then took the photo above. Here's another scene from Lost Season 2, Episode 5: ...And Found. Concerned that their daughter did not find a husband at Seoul National University and that she now is "silver" instead of "gold", Sun's parents have arranged through a matchmaker for her to meet the Harvard educated son of the owner of thirteen hotels including the Seoul Gateway Hotel. Sun-Soo Kwon, as portrayed by Korean actress Yunjin Kim, is not keen on arranged relationships, but she soon finds that she has an easy rapport and is growing fond of Jae Lee as portrayed by actor Tony Lee. On a subsequent lunch date, however, Jae confides in Sun that he while at Harvard he met an American woman and he intends to move there in six months and marry her. Distraught, Sun leaves the hotel dining room and goes for a walk along the canal. This is where Sun and Jin first meet face to face and speak to each other. Their meeting actually takes place along the Ala Wai Canal near the recently rebuilt Kalakaua Avenue Bridge into Waikiki. This is right near the Honolulu Convention Center. You can clearly view the bridge in the screenshot of this scene.